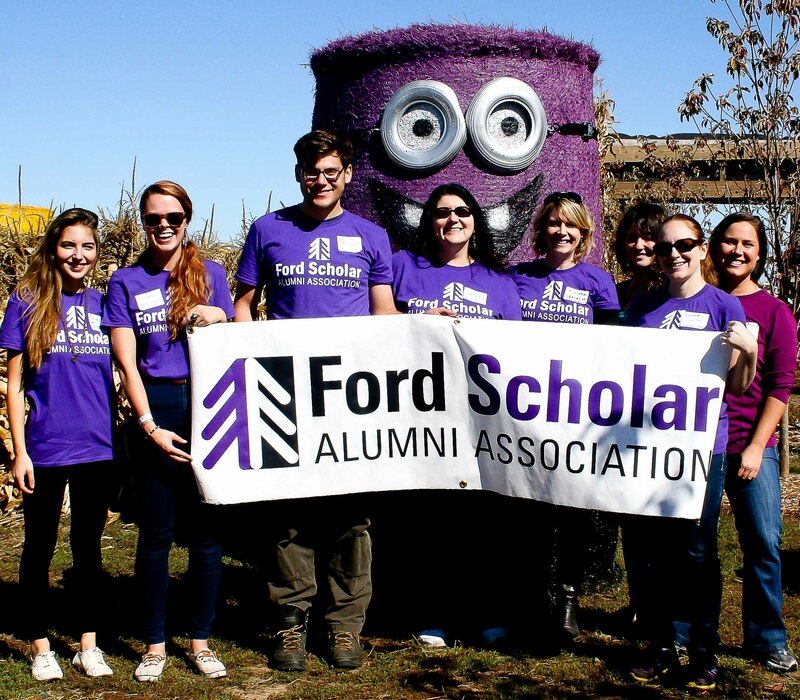 Sporting their festive purple T-shirts, Ford Scholar Alumni appropriately met in front of a giant purple Minion made of hay during the fifth annual alumni fall get-together and pumpkin spectacular at Bauman’s Farm and Garden in Gervais, Ore., on Saturday, Sept. 26. Jensen’s younger brothers and sisters came to the Bauman’s Farm and Garden Fall Harvest Festival, and fellow board member Danielle Currey brought her family as well. Board members offered the new FSAA purple T-shirts for a $25 donation and Ford Scholar planners for a $15 donation. Proceeds benefit the FSAA. Currey helped staff the FSAA table in the Food Court and said conversations at the table included networking opportunities between alumni as well as encouraging alumni to get involved, join the board and attend the summer get-together at the coast next year. “We also spoke with a group of students regarding the scholarship who are potential future scholars,” she said. The annual autumn alumni social gathering is a fun event for Ford Scholar Alumni and their families to get together and enjoy the festivities of fall, said FSAA Vice President Kirsten Yamada. While hunting for pumpkins and eating apple cider donuts, it is also an opportunity for alumni to network with each other and share connections and resources.